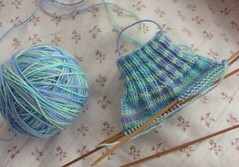 I was in a knitting mood yesterday, so I started a sock! I don't dare say a pair of socks because it's been quite awhile since I've finished one sock much less a pair! :) I bought this yarn a looong time ago - it's Lorna's Laces, and wow is is it nice to work with! So soft and I love the colors! Very Pretty Yarn! I love it when babies fall asleep in your arms, my 4 year old still does this several times a week in the afternoon. I'm sorry Matthew is still having a hard time, poor guy. I know what you mean about saying you are knitting a sock - not socks. I knitted a mitten! That's so pretty! A friend of mine is actually just knitting single socks. She is too eager to start her next type of yarn to finish the second one. So we really must look for a one-legged man for her and then she is all set! Oh I love that color yarn!!! I want to learn to knit socks - yours is going to be great!